How can freedom be possible if independent thought is the direct enemy of the government? This ageless contradiction lies at the heart of the schism between communist China and the western-bred populace of Hong Kong, which was promised that its sovereignty would be preserved after the 1997 Handover marking the end of British rule over the territory. Yet the grip of the Chinese Central Government has been tightening around the region ever since, as evidenced by the pro-Beijing Election Committee that selected CY Leung as the current Chief Executive of Hong Kong. His assertion that “any rebellious act is futile” is entirely bogus, since he would’ve never been elected had it not been for the social movement against foreign rule that culminated in the Handover. Beijing’s desire to screen candidates before citizens can vote on them isn’t all that different from America, where politicians are funded by special interests who will directly profit off of them. Just as President Trump wants to silence the people’s voice by defunding the National Endowment for the Arts, China wants to brainwash the people’s mind by controlling the education of its youth. When a National Education plan fraught with patriotic propaganda is proposed for implementation in Hong Kong schools, one young student decides to lead the revolution against it. His name is Joshua Wong, and he is the subject of Joe Piscatella’s rousing documentary, “Joshua: Teenager vs. Superpower,” which snagged an Audience Award at Sundance this year. Even during his early teen years, Wong embodied the grassroots spirit of Bernie Sanders, revolting against the injustice of a government intent on stripping away the rights of its citizens. 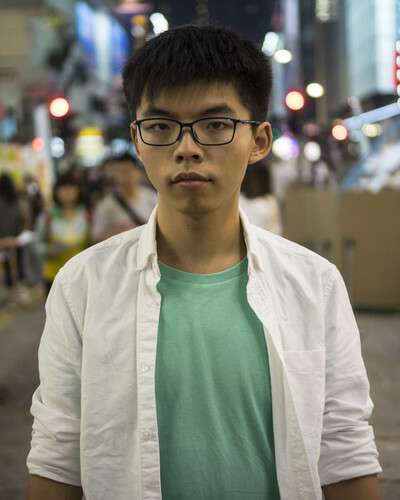 At the mere age of 14, he founded the pro-democracy student activist group Scholarism, attracting new members with his eloquent televised interviews. One of Wong’s close friends from Christian Fellowship, Derek Lam, explains how the group speaks to Hong Kongers who don’t consider themselves Chinese, referring to the region’s superstar Bruce Lee as an idol of power that Scholarism aspires to emulate. Derek’s quip that “in order to defeat Vader, you have to train some Jedi” illustrates how the classic Jungian archetypes resonate with modern youth tasked with cleaning up the mess left by past generations. “Where are the adults?” Wong screams at a rally, acknowledging the inaction of his elders, many of whom are likely too scared to speak up. “Joshua: Teenager vs. Superpower” is not a great film on the order of Nanfu Wang’s “Hooligan Sparrow” or Alison Klayman’s “Ai Weiwei: Never Sorry,” both essential profiles of muckraking activists whistleblowing against government corruption in China, but it does have an equally great story to tell. It is Piscatella’s second film about courageous teens, following 2013’s “#chicagoGirl: The Social Network Takes on a Dictatorship,” about a young woman in the Windy City suburbs who utilizes social media to help run the revolution in Syria. The most moving footage in this film surveys the sheer scope of people who turn out in support of Scholarism’s demonstrations. A few days prior to the 2012 launching of National Education in Hong Kong, Wong and his fellow student activists began occupying a public square at government headquarters. Aside from a brief encounter in front of news cameras, Leung chose to ignore the students until they were joined by 120,000 protestors, thus forcing him to announce that the education plan would not be mandatory in Hong Kong. This astonishing victory proved to be short-lived, as Xi Jinping, President of China and General Secretary of the Communist Party, accelerated the pressure to destabilize Hong Kong’s democracy by proposing a reform to its electoral system that would prevent citizens from freely choosing their own leader in this year’s election. It’s no surprise that Beijing’s favored candidate, Carrie Lam, triumphed in March over her opponent, John Tsang, who was more popular with the public. Piscatella chronicles the 2014 reform protests launched by Scholarism and to a lesser extent, the Occupy Central moment, that ran for 79 days. Police resorted to using tear gas and pepper spray on the crowds in order to heighten the fear of another Tiananmen Square massacre, but their weapons only attracted more protestors armed with umbrellas, a common item ingeniously transformed by the public into a political statement. Whereas Occupy Central’s leader, Benny Tai, peacefully surrendered at the end of the protests, Wong placed himself on a hunger strike until doctors urged him to quit. He is devastated by the “failure” of the Scholarism movement to accomplish its goal, but the extent to which it raised awareness of the corruption in China should deem their efforts a resounding success. The persistence of this young man is awe-inspiring, yet the biggest shortcoming of the picture is its inability to paint a fully dimensional portrait of its own subject. A longtime member of Wong’s group, Agnes Chow, confesses that it’s difficult to be friends with him because he’s so skilled at concealing his emotions. His peers compare him to a robot with an on/off switch, and as soon as that switch is flipped on, Wong is unstoppable until he finds himself under arrest. There are times he seems almost superhuman, and aside from a fleeting interview with his mother (who is seated next to her silent husband), we get no sense of Wong’s home life, nor what drove him to set aside his GPA in order to save his country. Though it falls short on a personal level, the film succeeds as a profile of the student movement itself, which has continued after the dissolution of Scholarism with the founding of a pro-democracy political party, Demosistō. Last year, the party’s chairman, 23-year-old Nathan Law, became the youngest lawmaker in the history of the Legislative Council, winning one of the few democratically elected positions in China. Distributed as a Netflix Original Movie, “Joshua: Teenager vs. Superpower” is a worthy addition to the streaming platform’s roster of documentaries about inspirational young people (including my favorite film from last year, Rokhsareh Ghaem Maghami’s “Sonita"), and a stirring ode to the power of the individual in a society that values conformity over individuality. When Wong was invited to speak at an event in Thailand late last year, the Chinese government ordered for him to be detained and deported promptly upon arrival. If China continues to censor the voices of activists like Joshua Wong, Ye Haiyan and Ai Weiwei, they shouldn’t expect America to play ball—that is, if America is still indeed a democracy.